In 1635, the decade to which this panel has been dated, David Teniers II entered the guild of Saint Luke in Antwerp and married Anna, one of Jan Brueghel’s daughters. Teniers trained with his father and primarily dedicated himself to genre paintings although he also produced landscapes and mythological, historical and religious paintings. Together with Adriaen Brouwer, David Teniers II is considered one of the most important 17th-century Flemish painters, with a large oeuvre that continued until the 1680s when the artist was still working at the age of seventy. Teniers was in the service of the Archduke Leopold William, Governor of the Low Countries, and was Dean of the Guild of Painters in Antwerp. In 1665 he opened an Academy in that city, having obtained the permission of Philip IV of Spain and of the Antwerp painters’ guild. For his genre compositions Teniers looked to Adriaen Brouwer, an artist who not only inspired him but whom he also copied on commission, as we know from a document published by Denucé. 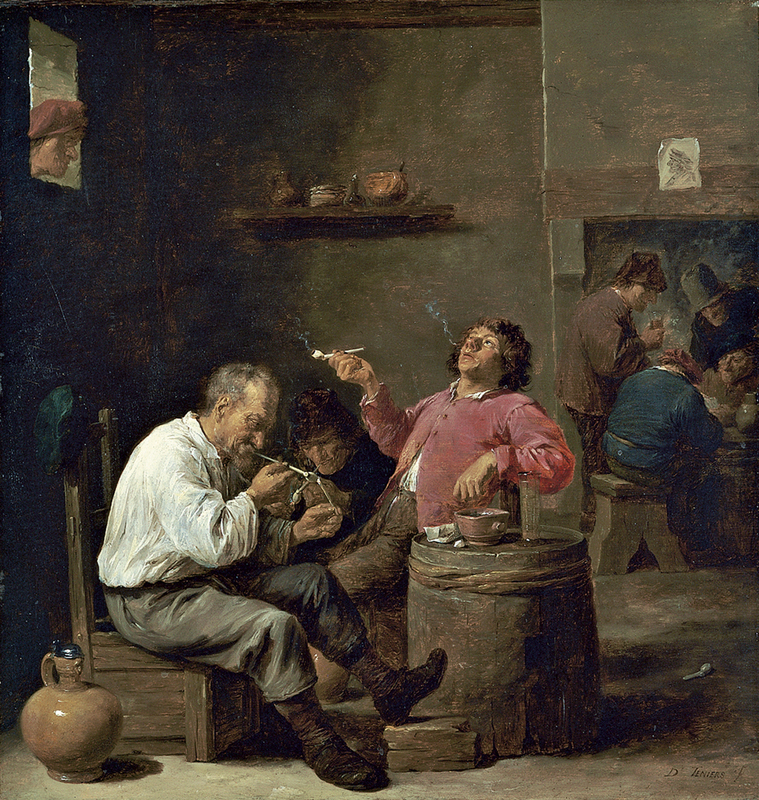 Brouwer also invented the motif of smokers in an interior, an innovation that he included in his genre paintings during his time in Antwerp. Aside from the fact that he was indebted to another artist for this subject, Teniers’ smokers are a fine example of his work with regard to composition, treatment of space and approach to the subject. In the present work the artist located three men in an interior seated around a barrel that acts as a temporary table. The colour range is predominantly based on brown and grey tones. The seated figure on the left, resting one of his feet on a footstool for greater comfort, lights his pipe. The second, on the right, leans back in a gesture that suggests that he is savouring the smoke that he has just inhaled from his pipe, some of which is still in his mouth while the rest is subtly dispersing in the air around him. The third man is located almost frontally, concentrating with great intensity on the object that he is holding. Teniers completes the composition with a second focus point before the fireplace in the background, while the third important element is the head of a man poking through the brightly-lit window at the upper left. Together with these rough but colourful local types, among whom the figures in the foreground in their white and pink shirts are particularly striking, also notable is Teniers’ interest in the objects that he has arranged in this humble interior. They include a pitcher on the floor in the left foreground, the wood of the rough furniture (chair, stool and barrel), the simple still life consisting of just a few items on the top of the barrel, and the shelf with kitchen items on the wall. Each conveys a wide range of textures in a way particularly distinctive of Teniers in his compositions. The panel was previously known as The green Cap after the cap hanging on the back of the chair of the figure on the left. This rather commercial title was replaced by Gaskell with the less specific Smokers in an Interior.